Walking barefoot for a charitable cause and movement, looking back to 2011, my first time participating in Bare Your Sole. This was my fourth year participating in Bare Your Sole 2014! Bare Your Sole 2014 saw 5000 participants walking barefoot and helping to raise close to $300,000 in the fight against homelessness and poverty. 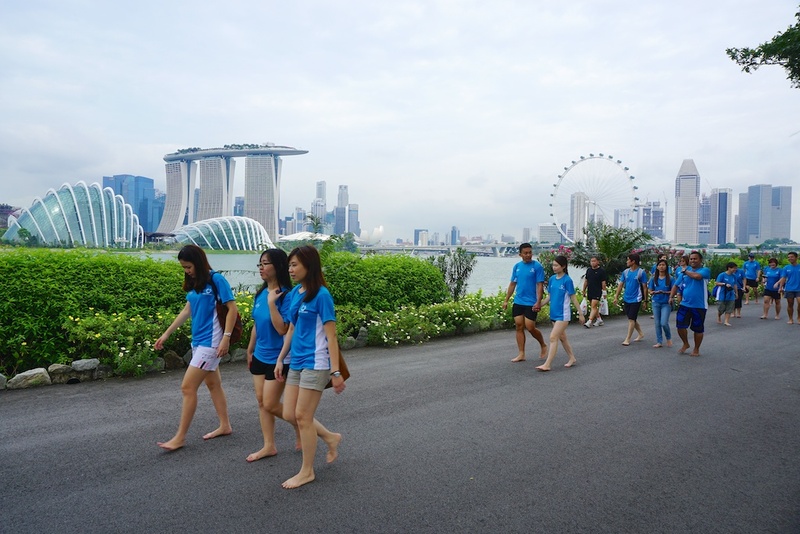 The charity barefoot walk was held at the iconic Gardens By The Bay – Bay East and the 5000 participants were able to enjoy the good weather and sceneries of Marina Bay and Gardens By The Bay during the walk! Here’s a throwback to my Bare Your Sole participation in 2012 and 2013! There were a few notable famous participants rallying the enthusiastic crowd and amongst the 5,000 strong troop were Habitat Ambassadors – Television host, film producer and former Nominated Member of Parliament, Eunice Olsen, model, actor and host, Paul Foster and travel host and writer, Anita Kapoor. 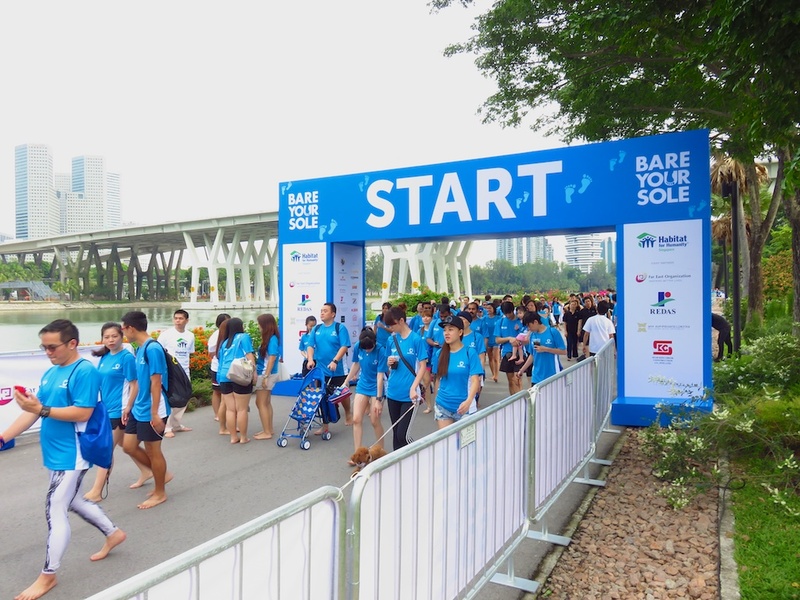 It was great to see the number of participants that turned up at Bare Your Sole 2014, they were there for a good cause and enjoyed their time with their friends and loved ones. Some families brought their young children along too and they were just as sporting in walking bare foot too! For those that signed up for the 5km route, they walked towards Marina Barrage and I saw many participants relaxing at Marina Barrage, taking photographs of their barefoot together, group photos and group selfies too! There was something special during Bare Your Sole 2014 that was brought to my attention by the public relations agency, Porter Novelli, for Bare Your Sole 2014 – Making up the 5,000 participants were over 50 migrant workers from Kim Seng Heng Engineering Construction Pte Ltd, some of which were inspired by personal events back home and wanted to do their part for the Singaporean community. “Bare Your Sole is an event that my colleagues and myself enjoy and relate to, as some of our families back home do not have a decent place to live in,” said Mr. Raman Ganesan, Safety Coordinator of Kim Seng Heng Engineering Construction Pte Ltd. “I am glad to have had the opportunity to contribute my share to this meaningful event.” At the end of the walk, the participants were treated to a morning of fun and entertainment for the family and friends, with live performances from local entertainment acts along with food and beverage. It was great to be part of Bare Your Sole 2014, helping to continue spreading the message and awareness! Here’s some of the photographs I took during Bare Your Sole 2014 on Flickr!